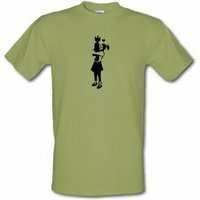 Home / Retro T Shirts / Banksy Rat male t-shirt. There are a lot of rat depictions in Banksy’s work ain’t there? Also a lot of government and societal satire. Whatever design it is though if it’s from the famed street artists you can be sure of its novelty so buy your Banksy graphic t-shirt now!